The Vehicle Information Management System (VIMS) is your window into Manheim for sellers, providing information about your vehicles to assist in getting the best results. Manheim’s ValueFinder is a powerful analytical tool for vehicle fleet owners and managers, providing an insight into current market conditions for your vehicles. You can view the current market value of all used passenger cars and light commercial vehicles sold at Manheim in Australia, supplemented by industry price guide information. ValueFinder lets you select model variants by build year, make, model, engine, transmission and body style. 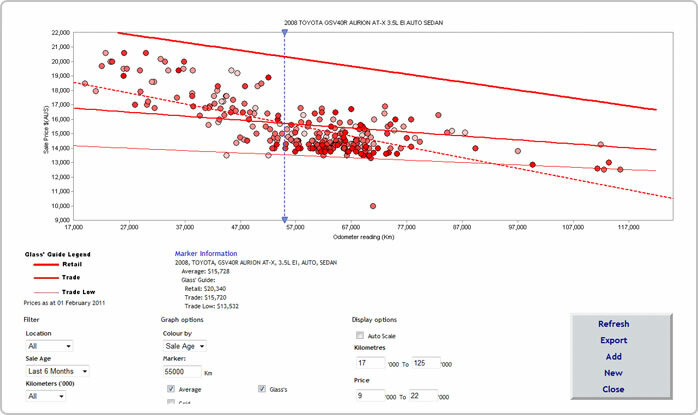 It presents sales of these vehicles graphically, showing the relationship between odometer reading, location, sale age and the sold price. Every vehicle sold is represented as a dot on the graph. Colour and options of vehicles sold. Graphs can include 'retail', 'trade' and 'trade low' prices as supplied by independent industry source Glass's Guide, particularly useful on low volume vehicles.